1971 was the time when a host of disparate masterpieces were released, from Led Zep's IV to Marvin Gaye's What's Going On to Joni Mitchell's Blue. One can hear the mix of styles in the air in Jackie DeShannon's music as part of the era's zeitgeist. 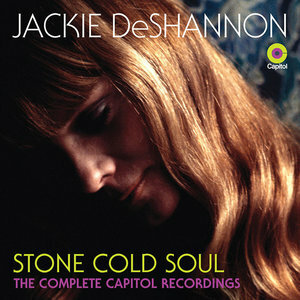 Jackie DeShannon's musical career began back in the 1950s. As a young teenager, she began recording as a rockabilly filly known as Jackie Dee and then as a pop-rock singer-songwriter who accompanied the Beatles during their first American tour in 1964. During the mid-'60s DeShannon's songs were covered by everyone from New Orleans soul singer Irma Thomas ("Breakaway") to folk rockers the Byrds ("Don't Doubt Yourself Babe") to British Invasion acts like the Searchers ("When You Walk Into the Room") and Marianne Faithfull ("Come and Stay With Me"). She began co-writing songs with notables such as Jimmy Page and Randy Newman. In 1969 DeShannon hit it big with the million-selling hit song, "Put a Little Love in Your Heart". It was not long after that, in late 1970 when DeShannon switched record labels and signed with Capitol. Much of the material DeShannon recorded then was deemed uncommercial by her record label and went unreleased. Her complete Capitol recordings are gathered here for the first time. The results reveal DeShannon's exceptional talents as a singer and a songwriter with varied tastes that couldn't be pigeon-holed, packaged and sold as a simple commodity. In fact, the one album that Capitol released at the time with some of this material was simply called Songs as its diverse contents belied any more descriptive title. The first 15 tracks here were recorded at American Sound Studio in Memphis with the Memphis Boys who had backed up Dusty Springfield, Elvis Presley, the Box Tops and others who sought the place's soulful charms. It was material that seemed to most confuse the record company executives as many of these tracks never made it to Songs. That was a shame because DeShannon shines on these cuts. She begins with a short, sharp gospel-tinged rendition of William Bell's 1961 classic "You Don't Miss Your Water" that only lasts 76 seconds. The musical accompaniment is sparse and lets DeShannon sing the lyrics with a passionate intensity without having to raise her voice. It's breathtaking to hear. No wonder this collection is called Stone Cold Soul — which is an accurate description of this and many other of the Memphis cuts. "Stone Cold Soul" is also the title of a bouncier tune that employs horns to give the track a sexier vibe. DeShannon goes all over the musical map on these Memphis recordings, from the mines of West Virginia mines to the blooming deserts of Israel, from getting high in San Francisco to the gentle heartbreak of George Harrison's "Isn't a Pity" (soon after the former Beatle's release). Remember, 1971 was the time when a host of disparate masterpieces were released, from Led Zeppelin's IV to Marvin Gaye's What's Going On to Joni Mitchell's Blue. One can hear the mix of styles in the air in DeShannon's music as part of the era's zeitgeist. Capitol then sent DeShannon to Hollywood to record a new record with a West Coast vibe. She continued to work in a variety of styles, but the musical accompaniment is more upbeat. She performs a rollicking version of the spiritual "Down By the Riverside", a sultry cover of Bob Dylan's "Lay Lady Lay", a stately rendition of McGuiness Flint's "International", and three self-penned numbers including "Salinas", a tribute to James Dean. The individual tracks have their charms but lack the punch of the Memphis numbers. Stone Cold Soul: The Complete Capitol Sessions brings together every track DeShannon recorded for Capitol, including five previously unreleased tracks and all of her Songs LP. More than 50 years after their initial creation, the music still has the power to thrill.